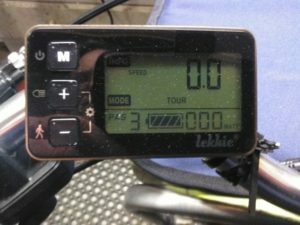 A few posts below I mentioned that the handlebar display panel was a fairly standard C963 display panel, branded as a Lekkie. It is based on the KM5S made by King-Meter. A quick review of its capabilities compared to what the KM5S manual contains shows that it is quite heavily customised. I am not sure if this is standard Bafang customisation, or whether it is a combination of Bafang and Lekkie requirements, in order to be able to call he motor a 300W motor. Either way, it is not possible to change the PAS settings to 9 from 5, it is not possible to change the top speed on the display panel, and it is not possible to get into the “Personalizes Parameter Setting” section, where there are many more settings of interest. None of this is a real issue, but I do like to tinker occasionally. One of the main issues for me is the integration of the control buttons into the display panel. This means that I either have the display panel in the middle of the bars, and have to reach over to the panel to change the settings, or I move the display panel so that the buttons can be used while my hand is still on the left hand grip, which puts the display way over to the left, and because of the swept back bars makes it more difficult to read. So I started to look around for something better. One or two suppliers of Bafang mid drives have started offering a couple of high end display panels, in some cases they are customised, as in the ones by Luna and EMPowered Bikes, and others seem to be as they come out of the factory, from places such as PSWPower and others. There are two models of interest, the DPC-14/750C and the DPC-14/850C. Both are colour screens, both have separate push button units attached with waterproof connectors to the main unit. You can look them both up on the internet, they are for sale in many places, on e-bay, Amazon, DHGate and AliExpress , for around the same price give or take $10. Reading various forum entries, and write ups on websites of retailers, there are some significant differences. The 750C is landscape mode, whereas the 850C is portrait, and the 750C appears to be much more limited in what it can do. They are both direct replacement for the C963 on the BBS02 centre drive from Bafang, and have similar methods of changing parameters etc. Basic operation seems very similar to the C963, so there will be little extra to learn. So I have taken the plunge and ordered a DPC-14/850C from AliExpress, which is actually being supplied by PSW Power who appear to be a rebranding of ELife Bikes, whom I bought my first ebike kits from! These are not a cheap unit, about NZ$115 delivered, but I am really looking forward to installing it and setting it up to suit how I want my bike to perform. 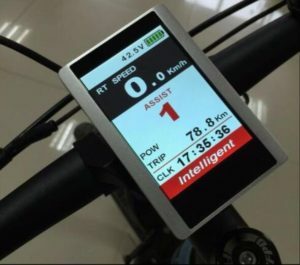 You can see a couple of its features below, namely a real voltage meter, a power meter as well as all the usual speed, avg speed, top speed, odo, trip options. It also has a clock, but as this does not have a battery, the clock needs resetting before each use. Great if you really need it, otherwise something to ignore. 3, 5 or 9 PAS levels are available via the settings. Bad points – it says Intelligent at the bottom of the main screen! Apparently while this is in firmware, no one knows how to change it yet. It is in transit as I write, it left Hong King airport a couple of days ago, depending on how many other courier hub airports it goes through, it may be here in two to five days. Better photos and write up when it arrives.